Terri Webster Schrandt worked in the public parks and recreation field for 35 years. She was a recreation and leisure practitioner for a large city in Northern California. She retired in late December 2014. She continues to teach as a part-time lecturer in the Recreation, Parks and Tourism Administration department of a large Northern California university. Her second act, as a consultant, will be to help people find their leisure-life balance. Her blog is TerriWebsterSchrandt.wordpress.com. Exactly one month ago, I retired from public service in recreation and parks, after 31 years. I shared several blog posts about my retirement experience, including a guest post on A Momma’s View. I thought this might be a good way to wind up my retirement series with a post from the daily prompt Enough Is Enough. Yes, the fight is over. After sitting through drastic changes to our recreation department as a result of the great recession, and enduring the miserable decisions our City leaders made, I had to throw in the towel. After watching countless colleagues get laid off while management still kept their jobs, and saying good-bye to another group of retirees, I had to call it a day. After my staff and I worked our arses off to “make it work,” I gleefully filled out my retirement application. After navigating even more changes with the influx of new management coming and going, making crappy, program-killing decisions, the exit door could not hit have hit me on the way out any quicker! Now that the fight is over and my stress levels are very low (I’m sure my cholesterol numbers have improved), I do have to get organized. The image above is of a card I received when I retired. It seems to imply that retirement is a lot of napping and doing nothing. While that may be great for some people, resting and napping is not my idea of retirement. On the other hand, I do have to admit to hitting that snooze button too many times and putting my feet up…a lot! 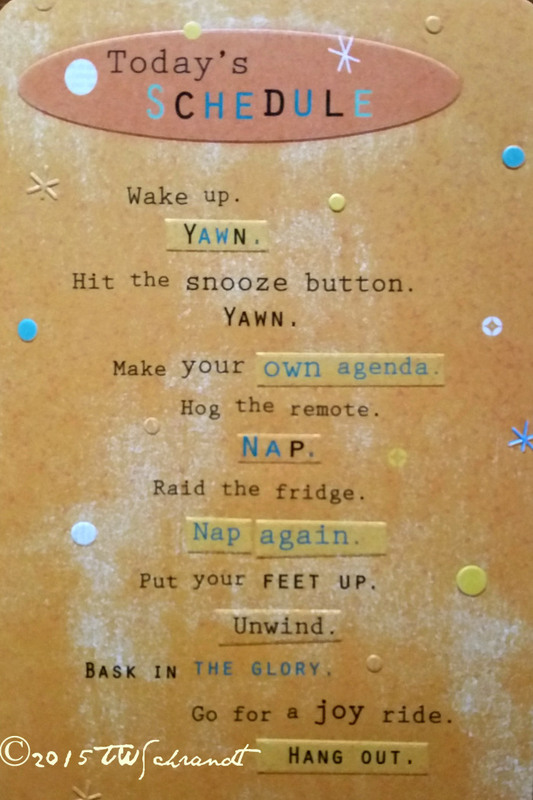 But the idea of making my own agenda—now that is the tricky one! A task that I am implementing today. I have a new calendar. After years of using on online Outlook calendar for everything, I have a beautiful, 2015 spiral-bound planner highlighting Thomas Mangelsen’s wildlife photographs. Here I keep my blog post schedule and ideas, my workout schedule, and any appointments I have (I had three appointments last week!). With this low-tech tool, I also schedule my daily routine for my consulting business, and preparations for my future university courses and lectures. I love technology. I loved having an online calendar. When I worked full-time I was ridiculously busy; a calendar tied to my outlook account for work and personal time was a necessity. A simple click on my I-phone, and there was my life, laid out week-by-week. That was back in the day when I carried two mobile phones; my own and my work phone. I had tried to use planners before, but they ended up in the office supply graveyard. In order to effectively use a real planner, I had to retire. Enough is enough. Now, back to putting up my feet and basking in the glory of a new beginning. If you would like to add your voice to the Guerrilla Aging segment of Life in the Boomer Lane, just send your post (either new or previously published) to Renee at lifeintheboomerlane@gmail.com. She will publish your words for her soon-to-be 11,000 subscribers to read. Hopefully, she won’t screw things up like she did with this piece, which was originally published on Friday, with credit given to another blogger. Interesting post. Retirement is not something I think about often (I’m 22), but I always wondered what it would be like to shift from high gear in the work place to having an open schedule. It seems like busy people like Terri will always keep themselves busy, and vice versa. I always imagined myself working until my last days, but I never thought about the “type” of work I would be doing. Maybe doing something very creative or social would be a better way to spend my retirement years than working. I always thought I’d work until I died but now can’t wait until I’m able to retire. Have a great and personally productive retirement! Aye,,,9 more years until retirement for me. Best of luck on your retirement from Parks & Rec. What is annoying, that at work, a recent early retiree is back working part-time for us. She clearly tells us she’s bored. She moved to a tiny village of 3,000 people from 40,000 people. Evernote, I am retired and trying to figure out what is what regarding my time etc. My daughter is a college teacher and she introduced me to Evernote. FYI it syncs with all your devices. Wow, I wish I had it when I was working. 40 some years in IT. I also used Outlook and multiple emails and calendars and web pages when working. Anyway I find Evernote fun and easy to use. If you try it make sure you try the browser clipping add-on/extension. Luv the card. Thanks to everyone who commented on this great post!